Milenko Šerban was born in 1907 at Cerevic village, Serbia. He have been schooled in Novi Sad, Serbia under tutilage of Vasa Eskicevic. He follows that with studies abroad in Paris, France at Kolarosi Academy under Professors P. Le Due, Andrea Favori and Andrea Lot. After the studies he returns to Novi Sad, Serbia and works at Professor in the Craftsman School of Novi Sad. His first individual exibition have been in 1926. 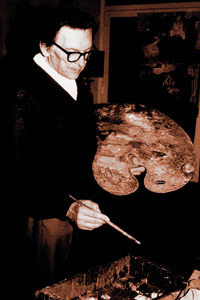 He was member of Art Groups "Oblik" and "Sestorica". In 1930's he started work as scenographer for Serbian National Theater and for Public Theater of Dunav Banovina Region. After the World War II he took position as the head of the Museum Matice Srpske in Novi Sad. In 1948 he moves to Belgrade and works as scenographer for the Yugoslavian Dramatical Theater. Later he becomes Professor at the Belgrade Un iversity Academy of Arts. He died in Belgrade in 1979. Parizu na Akademiji Kolarosi, kod profesora Pikara Le Dua i Andrea Favorija, a zatim kod Andrea Lota. 1926. godine. Bio je član Oblika i Šestorice. u Novom Sadu. Posle Drugog svetskog rata radio je kao kustos i upravnik Muzeja Matice srpske u Novom Sadu, do 1948.
na Akademiji primenjenih umetnosti i Akademiji za pozorište, film, radio i televiziju u Beogradu. Sadu 1968. i u Sremskoj Mitrovici 1974. godine. Njegovi omiljeni motivi bili su mrtva priroda i enterijer, ali u okviru njegovog opusa srećemo i pejzaže, kao i brojne portrete. Umro je u Beogradu 1979. godine.